China and India are actively competing with one another in East Africa, though this struggle for influence has largely failed to attract significant global attention. Both Great Powers are reluctant to recognize this in order to preserve their superficial and largely limited partnership through BRICS, while the US and its Mainstream Media partners don’t want to “jump the gun” and pressure India into this role too much to the point where its leadership backtracks in order to “save face” and deflect accusations of being an “American proxy”. This is therefore a very sensitive topic, albeit one that deserves further investigation because of its geostrategic implications, particularly as they relate to Great Power competition more broadly and Africa’s rising role in the world more specifically. China needs Africa as a market to sell its overproduced goods to in order to sustain domestic economic growth, while India needs the continent in order to grow into a Great Power with a truly transregional reach. Accordingly, China unveiled its One Belt One Road global vision of New Silk Road connectivity in 2013 in order to meet this pressing strategic demand, while India followed up last year in 2017 with the “Asia-Africa Growth Corridor” that it plans to construct together with Japan. China’s focus is on building physical infrastructure and issuing no-strings-attached loans to fund these megaprojects, while India intends to improve the capacities of Africa’s citizenry by investing in job training programs, education, and healthcare. These connectivity initiatives are complementary to one another in principle but end up being competitive in practice due to the New Cold War pressures being put upon each Great Power. A security dilemma has progressively developed between them as China’s naval base in Djibouti was politicized by the Western Mainstream Media and government officials as supposedly being the first step in a continental-wide military expansion. As such, India was encouraged to stake out an overseas military facility in the Seychelles, which it – just like China – claims isn’t aimed against anyone. Clearly, however, the Indian move was in response to the Chinese one and was more than likely supported by New Delhi’s new “Western partners” who have an interest in “containing” China and turning the South Asian state into its chief rival all across the Indian Ocean Rimland. None of this will ever be openly admitted by any party because of the sensitivity involved in officially recognizing this for what it truly is, but it’s difficult to come to any different conclusion when considering the seemingly coordinated moves that were just described. 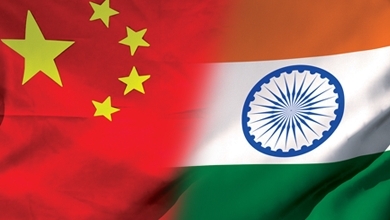 One action appears to have beget an equal and reciprocal reaction in this Great Power rivalry, though with one of the parties – in this case, India – being encouraged to do this by its third-party partners who have a shared interest in “containing” China. To be clear, one prospective Indian military facility isn’t going to “contain” much when it comes to China’s involvement in Africa, but the point to focus on is that it’s a start and could portend the unveiling of a more robust policy from New Delhi in the near future, one which might even come to receive multilateral support from others. There’s another driving force behind the Chinese-Indian “Great Game” in East Africa, and it’s the fear – whether justified or not – that China’s New Silk Road ports might one day come to have a dual purpose in laying the basis for the speculated expansion of the country’s military footprint in Africa. This narrative might have been introduced as part of a weaponized infowar operation to justify the establishment of anti-Chinese military bases in the continent by countervailing powers such as India, especially when it comes to convincing its people of the perceived need for their government to take such an unprecedented move in the first place. Whatever the origins of this prediction, it’s evidently served its purpose by catalyzing a self-sustaining cycle of competition between China and India in East Africa, one which began in the economic sphere but is now rapidly taking on military dimensions. The relationship between military moves and informational warfare campaigns to justify the first-mentioned has already been extensively studied by other researchers, though public knowledge is lacking about how this plays out in the case of the Chinese-Indian “Great Game” in East Africa, ergo the need for others to delve much deeper into this topic. It might be difficult to arrive at objective conclusions, however, given that each “side” has their own self-interested stake in controlling every dimension of this narrative, including in the academic realm, which is where the utility of Russian researchers could come in handy given Moscow’s excellent relations with both Beijing and New Delhi. Going forward, it would be a service to all who are interested in this field if more neutral observers such as those in Russia invested the time and effort into producing material on this topic, since it would greatly aid in the world’s understanding of the military-infowar relationship in the given context. The East African realm of competition that China and India are competing over is a geographically extensive one that runs from the Horn of Africa all the way down to the Mozambique Channel and can correspondingly be broken down into three separate theaters. The first one begins in the north and is centered on Ethiopia, one of the fastest-growing economies in the world and an aspiring Great Power. China built the Djibouti-Addis Ababa Railway (DAAR) in order to connect this landlocked giant to the global marketplace, but Beijing and its national companies of course don’t have exclusive monopolistic rights to its use. This means that India and other countries could utilize this megaproject in order to enhance their trade ties with the country, which will ideally lead to a “win-win” outcome where Ethiopia can continue its development and therefore become a more sizeable marketplace for China’s overproduced goods as well. The same logic holds true for Kenya and Tanzania, the two coastal states of the East African Community (EAC), where China is also building connective infrastructure projects. Beijing is behind the Standard Gauge Railway in Kenya and the Central Corridor in Tanzania, both of which aim to deepen the connectivity between these host countries and their organizational counterparts of Uganda, Rwanda, and Burundi. Tanzania is already linked to Zambia via the Cold War-era TAZARA project that represents China’s first-ever Silk Road investment in the modern era and which holds the potential for being expanded deeper into the mineral-rich southeastern reaches of the Congo one day too. Kenya and Tanzania are also more stable and developed than Ethiopia, making them much more attractive destinations for Chinese and Indian investment and the most suitable launching pads for their economic strategies in the continent. Lastly, Mozambique has a special place in the Chinese-Indian “Great Game” in East Africa because of its enormous offshore energy reserves in the north, some of which it shares with Tanzania. In and of itself, Mozambique doesn’t have much to offer to any potential partners because of its rampant underdevelopment and comparatively small population, which is why its energy potential becomes disproportionately important. China and India are both craving new sources of supply, and it remains to be seen whether Mozambique will balance between these two Great Powers or sell more of its reserves to one or the other. In addition, any prospective reserves exported from Mozambique to either of these two would have to pass very close to the Seychelles, demonstrating a degree of prudence on behalf of India’s decision makers or their foreign patrons in choosing this country for an overseas base. As it currently stands, the competition between China’s New Silk Road and India’s “Asia-Africa Growth Corridor” is amicable at the moment and has yet to develop into anything too dramatic, but it must be accepted that the rivalry between these two has only just begun and is still in its early stages. According to the dynamics of chaos theory, it’s precisely at this time when the contours of any complex system and its working processes are formed, meaning that these moves will likely set the trajectory for how the rivalry between China and India will play out in East Africa in the coming years. Bearing that in mind, it’s possible to forecast the general direction in which events will unfold, relying on the observation that China’s strategy is to focus more on “hard” development while India’s is to take care of its “soft” counterpart. China is hoping that the “head start” that it has over India in investing in Africa will lead to preferential trading arrangements with its partners, specifically those in East Africa who are its initial points of contact with the continent for geopolitical reasons. Beijing has sought to win their loyalty through no-strings-attached loans, but as an added “insurance policy” and as evidenced from the Sri Lankan case, it has no qualms about trading in the debt owed to it for the physical assets that it built because of those very same loans, which might have unintentionally given “credence” to the narrative that it has dual military intentions in mind for those facilities. There’s a certain believability to that, however, since China will inevitably be compelled to protect its Sea Lines Of Communication (SLOC) just like all other Great Powers have done in history who depended on maritime trade for their growth. India, meanwhile, could carve out a valuable niche for itself and Japan – and perhaps even their other “Quad” allies of the US and Australia – by delivering on the expectations that are placed upon it in developing East Africa’s “soft” infrastructure and enhancing the competitiveness of its population. China has thus far either neglected to adequately invest in this sphere or hasn’t done so in as competitive of a manner as to make much of a difference on the large scale that’s needed, though that could obviously change in the future. China is developing all the necessary “hard” infrastructure routes in East Africa and leaving none to its rivals so it will sooner or later end up expanding its influence into their “soft” infrastructural realm, whereas they’ll be hard-pressed to do the reverse in stepping on China’s toes. Only time will tell which of the two sides will ultimately succeed in building better competencies among the East African population, but India might have an edge over China in this regard because it can rely on its partners to assist it, whereas Beijing has usually been reluctant in allowing even friendly countries to enter the economic space that it’s staked out for itself. That might also have to change in the future if China wants to keep up with its rivals, so it’s entirely possible that it might enter into multilateral coordination with its Russian, Turkish, and Pakistani partners in order to streamline investments and outreach activities that more robustly counterbalance the broad support that India is poised to receive. East Africa will benefit from this peaceful competition because it will compel all foreign stakeholders to offer their national partners the best deals possible otherwise their opponents will seize those opportunities. Maintaining stability and a balance of strategic power under these challenging and increasingly unpredictable circumstances would necessitate formal or informal agreements between the competing Great Powers in this sphere, therefore amounting to a de-facto 21st-century version of the “Scramble for Africa”, with each “bloc” accusing the other of seeking to exploit their African partners in a neo-colonial fashion. The aggregate damage that an intensified infowar campaign based on this highly sensitive narrative could cause might ultimately end up being counterproductive to all parties by getting Africans to conceive of them as exploiters who don’t have their genuine interests in mind, even if they do as per the self-interested explanations discussed at the beginning of this analysis. The society-wide cynicism that this could naturally produce might detract from Africans’ willingness to enthusiastically seize the developmental opportunities that each “side” is offering, which would be to their detriment if the deals are legitimately in their interests. The best proposal that could be made in light of these likely scenarios is for China and India to progressively involve their partners in support of their respective East African projects but not to do so too quickly in order to avoid upsetting the regional balance and inadvertently inciting an even more pronounced security dilemma than already exists. This, however, is an unenforceable suggestion that requires coordination and trust from both sides, which is presently lacking in general and especially when it comes to East Africa. The most probable development, therefore, is that the multilateralization of the Chinese-Indian “Great Game” in East Africa will speed up instead of slow down, and that it might end up becoming somewhat uncontrollable in the coming years. That doesn’t mean that anything dramatic is necessarily bound to happen, but at the same time, such eventualities can’t be discounted either. Even though it may seem like the current state of the Chinese-Indian “Great Game” in East Africa is the epitome of the “win-win” paradigm of International Relations, it shouldn’t be overlooked how “Black Swan” events separate from those connected to the multilateralization these two Great Powers’ rivalry could unexpectedly complicate everything if they lead to the sudden onset of domestic unrest – defined in this context as large-scale protests (Color Revolutions), “rebel” insurgencies, and terrorist offensives – or regional conflict like another Congolese Civil War. These high-impact events are conceptualized as Hybrid Wars, and they might be sparked or guided ex-post-facto by the US in order to disrupt any perceived advantage that Washington may believe that Beijing has in the three competitive theaters of this region. The worst-case scenario would be that a security crisis prompts China and India to fall into the trap of “mission creep” by militarily responding in order to protect their assets, after which the security dilemma between them might become unmanageable and finally explode. This is unlikely to happen anytime soon, except perhaps in the Congolese case, but there are still some regional fault lines that shouldn’t nevertheless be overlooked. The regular unrest driven by Ethiopia’s largest and centrally positioned plurality of the Oromo people raises concern about the country’s future stability if its new government doesn’t enact adequate reforms at the pace and scope that this influential minority group wants. Likewise, Ethiopia is surrounded by regional problems, whether the credible threats of an Egyptian airstrike over the contentious Grand Ethiopian Renaissance Dam, Eritrea’s reported assistance to all manner of rebel groups within the country, the consummate failed state of South Sudan, and the still-simmering Somalian conflict. The East African Community countries, although comparatively less at risk than Ethiopia, are also beset with identity-centric challenges to their stability and the threat of terrorist groups such as Al-Shabaab, though they’re more likely to be affected in the military and migrant sense by any prospective Third Congolese War if one ever breaks out. Another issue to keep in mind is that piracy might emerge near the Mozambique Channel as non-state actors try to profit from ransoms after taking LNG tankers and other ships hostage. This is admittedly unlikely but can’t be ruled out because the central government barely has any presence in some parts of Mozambique, especially in the Muslim-inhabited north, and the nearby island nation of the Comoros is full of desperate people who could easily be recruited into such schemes. Just like what happened in the waters around Somalia over a decade ago, an outbreak of piracy of the Mozambican and perhaps even Tanzanian coasts as well would trigger the militarization of this waterway and encourage extra-regional states like China, India, and their Great Power partners to scramble for naval bases in the area. New Delhi could already be ahead of Beijing if its base deal with the Seychelles passes through parliament and it leverages its recently concluded LEMOA-like “logistics” pact to use France’s naval facilities in the region, but China’s checkbook and suspected dual-use intentions of its nearby port projects could bring it back into the game. Having touched upon all of those scenarios, the odds of them happening appear to be slim at the present moment, and none of the examined East African states apart from Ethiopia and Kenya to a slight degree show any serious signs of domestic instability that could interfere with either China or India’s investments there in the near future. The Chinese and Indian military presences in the region will probably expand with time and be publicly justified by the need to protect their SLOCs, but they should nevertheless be monitored for signs that either of them are preparing to counter the other or intervene in any potential conflict. Thus, the “Great Game” between China and India in this part of the Indian Ocean Rimland will probably remain stable, albeit tense, for some time, and could possibly be leveraged to the advantage of each local player so long as they’re clever enough to play one of them off against the other to their country’s self-interested benefit, though the multilateral militarization of this region must through the introduction of each Great Powers’ partners to this competition could unexpectedly jeopardize regional stability. Andrew Korybko presented the above text on 18 April, 2018 at a conference about “Russian-African Relations In the Context Of Africa’s ‘Turn To The East’” that was hosted by the Russian Academy of Sciences’ Institute of African Studies, and which was later published in the book “Поворот Африки На <<Восток>> ИИнтересы России” (“The Pivot Of Africa To The ‘East’ And The Interests Of Russia”). This article was also published on Eurasia Future. All images in this article are from Eurasia Future (except the featured image on top left).